The general public, the media and most financial observers were largely unaware of the momentous event that took place on August 15, 1971. However, the implications of that event have had an enormous impact on global financial conditions ever since. On that date, US President Richard Nixon ‘closed the gold window’. In essence, this meant the US would no longer honour the Bretton Woods Agreement of 1944, which made the US dollar the world’s reserve currency, and allowed other countries to convert their US-dollar holdings into gold. In simple terms, the US defaulted. Those who may have glanced at the announcement buried within the pages of their daily newspaper were unlikely to have understood the implications for their financial future. Under Bretton Woods, there was some control over the money supply since other currencies were convertible into US dollars, and the dollar itself was convertible into gold. With the demise of Bretton Woods, the entire world found itself on a monetary system backed by nothing more than the faith and credit of individual governments for the first time in history – a pure fiat system. This meant there were no longer any restraints on the amount of money that individual governments could create at will. As a result, a flood of paper money was unleashed globally, a trend that has increased exponentially over recent years. The official justification for Nixon’s action was that foreign central banks were getting nervous about the dollar’s strength caused by a growing US federal budget deficit, and were converting US dollars into gold in increasing amounts. The US gold reserves had declined from a peak of 21,682 tonnes in 1948 to 15,821 tonnes by 1960. 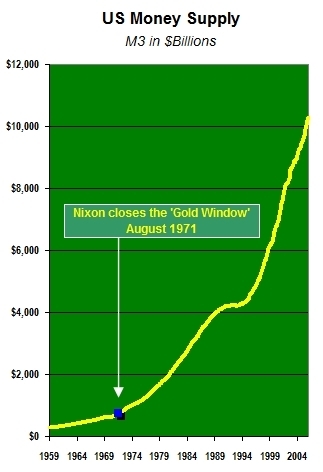 By the time Nixon closed the gold window, US reserves had dropped below 8,500 tonnes. Nixon could not risk any further depletion of US gold reserves. As a consequence of Nixon’s move, the US dollar declined against most currencies over the following decade, and declined 95% against gold as the price of gold shot up from *$35 per ounce to a high of $850 per ounce in 1981. The situation finally stabilized when the US Federal Reserve raised interest rates to 18%, halting further declines in the dollar and triggering a 20-year bear market in gold. Without the fiscal restraints inherent in a gold-backed currency, politicians worldwide were able to promise social programs and expand government bureaucracies that could be delivered through borrowing money created by the central banks rather than through direct taxation. They could embark on military campaigns with borrowed dollars that future generations would have to repay. And borrow they did, particularly in the US. In 1971 the total US federal debt stood at $436 billion. Today, that number exceeds $8 trillion. The 2005 increase in the federal debt of $571 billion was more than the total debt in 1971. Worse still, when calculated in accordance with Generally Accepted Accounting Principles (GAAP), and taking unfunded Social Security and Medicare obligations into account, the total federal debt is actually $49.4 trillion. This equates to more than $160,000 for every American. From a monetary base of about $800 billion in 1971, the growth in money supply started to accelerate exponentially from 1987 onward, as Alan Greenspan became more comfortable in his role as Federal Reserve chairman. During his term in office, he created more money than all the previous Fed chairmen combined. At the time of his appointment in 1987, the total broad-based money supply (M3) stood at $3.6 trillion. By the end of his 19-year tenure, it had increased nearly three-fold to a staggering $10.2 trillion. Greenspan’s replacement, Ben Bernanke, is likely to surpass Greenspan’s record. He earned the nickname ‘Helicopter Ben’ following a speech in which he said, ‘The US government has a technology, called a printing press (or, today, its electronic equivalent), that allows it to produce as many US dollars as it wishes at essentially no cost’, and suggested that the US Fed could resort to dropping money from helicopters if necessary. In the future, the amount of money created by the Fed will be difficult to determine since it has announced that, after March 2006, M3 will no longer be reported. The unrestrained creation of money since 1971 has gradually been eroding the purchasing power of most currencies, and has resulted in a subtle form of indirect taxation. 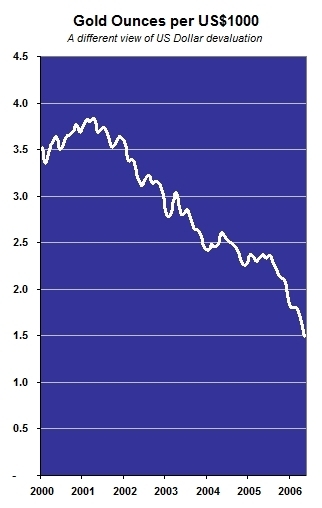 In terms of purchasing power, the US dollar has lost 82% as measured by the Consumer Price Index (CPI). All the world’s other major currencies, freed from the constraints of gold, have lost similar amounts. 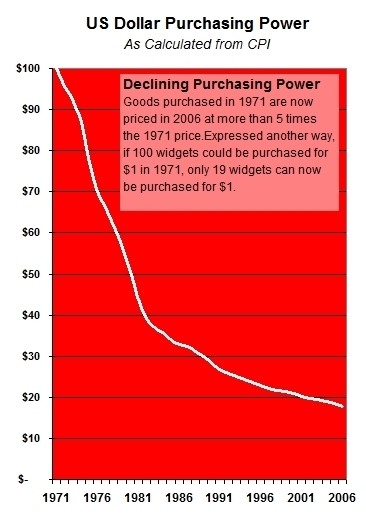 The Canadian dollar, for example, has lost 83% of its purchasing power. Today, most people view inflation as an increase in the cost of living as measured by the CPI. However, the accurate definition of inflation is an increase in the money supply that leads to rising prices. Increasing money supply is the cause; increasing prices are the effect. In recent years, most industrialized countries have been increasing M3 by more than double the reported increases in the CPI. Some of the annual increases in 2005 were: US 7.8%, Canada 8.4%, Euro zone 7.6%, and Britain 12.1%. Apart from increases in the cost of goods and services, expanding money supply can also lead to financial bubbles. In the 1980s, Japan increased its money supply by a factor of three. This led to both a stock market bubble and a real estate bubble. Both sectors experienced massive declines when the bubbles burst, and are still more than 75% below their 1989 peaks. In the US, expansion of the money supply started to accelerate after the market crash of October 1987, when Greenspan began lowering interest rates and expanding the money supply. The excess money first flowed into NASDAQ stocks. In December 1996, Greenspan made his famous ‘irrational exuberance’ speech as the NASDAQ approached 1,000. The market became even more ‘irrational’, however, and climbed to 5,000 by March 2000. When the first bubble burst, the NASDAQ lost 75% of its value, and today remains 58% below its 2000 high. As interest rates were lowered even further, new money flowed into the real-estate market, creating a housing bubble as consumers bought new homes with low-cost mortgages. The housing bubble set off a wave of consumer spending, as proceeds from mortgage refinancing were used to buy consumer products. Today the real- estate market is beginning to falter, with mortgage foreclosures and debt defaults accelerating. The effects of uncontrolled money expansion have already been experienced in Mexico, Brazil, Argentina, South-East Asia, Japan and Russia. Each has experienced a major currency crisis accompanied by plunging stock markets and collapsing real-estate markets, while many bonds and other debt instruments became worthless. Precious metals prices increased dramatically during these currency crises, acting in their traditional safe-haven role. Now, warnings of trouble ahead for the US dollar are being sounded. As measured by the US Dollar Index, the trade-weighted value of the dollar has declined by 25% from its peak in 2001. In gold terms, however, it has lost over 50%. Since mid-year 2005, all currencies have started to decline against the prices of gold, silver and platinum, signaling that astute investors are beginning to lose confidence in paper currencies and are turning to precious metals to preserve their wealth. As even more credit money is created, global investors will begin to lose confidence in the US dollar and question whether the US is able to repay its massive debt obligations. The US federal budget deficit, trade deficit and current account deficit are already growing exponentially. Eventually, investors will be unwilling to purchase US debt as they have in the past. This will force the Fed to increase the money supply even further in order to purchase federal debt obligations that foreign investors are no longer interested in. As more money is created, the exchange value of the dollar will plummet even further, and foreign investors will suffer increasing currency exchange losses. Eventually they will begin selling their US investments and converting their US-dollar proceeds into other currencies and precious metals. Just as all previous attempts to implement a purely fiat monetary system have failed, so will this 35-year paper money experiment. Throughout history, kings, emperors and politicians have never had the self-discipline to limit their spending in the absence of the restraints imposed by gold. While the timing of a US-dollar collapse and the global currency crisis that will accompany it may be difficult to predict, it looms ahead nevertheless. There is little chance that the mountain of US debt will ever be repaid, or that the US trade deficit will be reversed. Without massive inflation, the US has no way to meet its $50 trillion Social Security and Medicare obligations. As global investors look to other currencies, they will realize they are not fundamentally any better. Most foreign central banks will attempt to debase their currencies to match the decline in the US dollar in order to stay competitive in exports, resulting in a round of competing currency devaluations where all paper currencies decline relative to gold, silver and platinum. Individual investors, institutions and central banks will turn to the historical safe haven of precious metals to protect their wealth. Since all three metals are already in a supply deficit and aboveground supplies are minute in comparison to financial assets, growing demand will push precious metals’ prices dramatically higher. The ultimate consequences of Richard Nixon’s decision to close the gold window on August 15, 1971 will then be understood by everyone. *All dollar amounts expressed in US currency unless otherwise indicated.